Nowadays people should always be on guard. A man got used to protecting himself from different external effects. He puts on warm clothes not to fall ill, learns how to swim not to drown and avoids certain places and situations not to jeopardize his life. But sometimes just be careful isn’t enough. Sometimes other skills are required to protect oneself or someone in distress. The Kadochnikov System of fighting sports is not just self-defence technique. It’s the art of hand-to-hand combat and rules of survival in extreme conditions for soldiers of special mission units, which were adapted to contemporary conditions of peacetime and suitable for any other man. Since 1962 Aleksey Alekseyevich Kadochnikov has been training soldiers for security and defence agencies of our country. He also instructs officers in Krasnodar military schools and military units of Krasnodar garrison. For many years Aleksey Alekseyevich Kadochnikov was studying our battle heritage. Using universal knowledge and the latest developments in physics, mathematics, biomechanics, psychology he worked out his unique system of hand-to-hand combat– combination of theory and practice of one of the oldest type of fighting. Aleksey Alekseyevich Kadochnikov is the author of seven inventions, set of books, brochures and educational films. He was awarded many prizes including commendation by the Supreme Commander in Chief of armed forces Vladimir Putin. The Kadochnikov System doesn’t create a murder machine, it brings up a person who is capable to survive in the state of emergency. It’s not just a set of holds but in the first place it’s safety measures. The Kadochnikov System has been worked out for soldiers of special mission units, and this knowledge has already saved many of them. The author worked out his theoretical course in a way it to be accessible even to a non-specialist. In his work A. Kadochnikov shares his secret how to control your body. From scientific point of view he explains how man’s body works, some of these mechanisms people are quite unaware of. A lower acrobatics, meaning complex of exercises for moving under attack, is the basis of this body control technique. It’s obvious that defense is the basis of the Kadochnikov System. The author instructs how to release from all kinds of holds, overbalance your enemy and disarm him. And what is more important is that Aleksey Alekseyevich Kadochnikov pays great attention to the psychological aspect of the fight. It is no secret that if you keep cool and self-confident it may not only help in dangerous situation but also undermine your enemy’s morale. 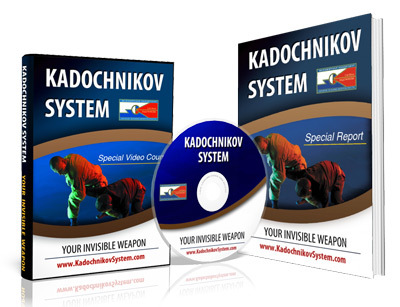 The Kadochnikov System teaches to mobilize inner resources of a man, helps him to forget about pain, tiredness and use all possible security facilities effectively. At the bottom of this tactics lies the trinity of physical, moral and intellectual forces. This simple and unique combination allows using only 25 percent of a man’s abilities. The trinity of forces makes it possible to use force more efficiently, save energy. Having this knowledge a fighter can keep fighting for a long time and can beat the enemy when forces are unequal (if the fighter is wounded or the enemy excels in strength or outnumbers him). Gosh, I wish I would have had that iniarmotfon earlier!